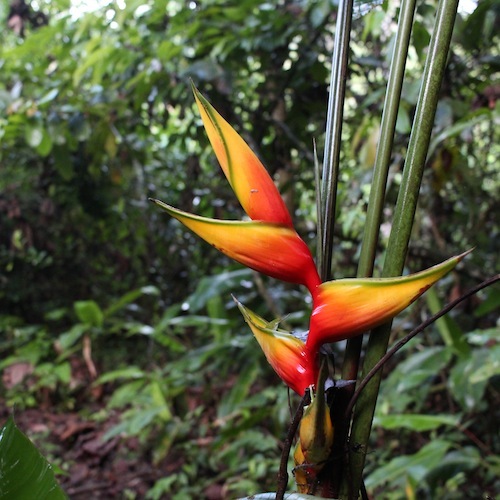 The field recordings of « F.Guyana » have been realized in the forests and the costal regions of French Guiana between the dry season and the « little rainy season » (November/December 2014, 2015 and 2016). Plage des Hattes, Awala-Yalimapo. Softness of the setting sun with a greenbrown sea tainted with red as a backdrop. Waves hemmed with foam and a hot breeze blurring the sound of palm trees and crickets make a répétitive music. Crique Popote, east of Saül. Beginning of the night. Cane toads (Rhinella marina) come out of the forest and cautiously step into the world of a creek which is still sleepy at the end of the dry season. Their powerful sonorous trills intermittently punctuate the silky humming of nocturnal insects. Same location, at daybreak. The first rays of the sun spray gold dust on emerging treetops. A colony of Yellow-rumped Caciques caw their wacky repertoire in the crystalline air. Guianan Red Howler Monkeys and cicadas – among other early risers – also make their way through thèse dream-like surroundings. On the dirt road to Saint-Élie, near Sinnamary. On either side of the road, a confused, impenetrable forest edge where even the whirring sound of hummingbirds and high-pitched droning of cicadas appear to be held back. Yet, here also, the forest offers a remarkable sensation to ears who like to listen, where each call, song or drummed sound seems like a cleverly written note on a timeless musical score. Above our heads, a woodpecker hammers at a piece of bark, tears it away and abandons it before flying away. On a path called ‘Boeuf Mort’, near Saül. The dark night shivers. 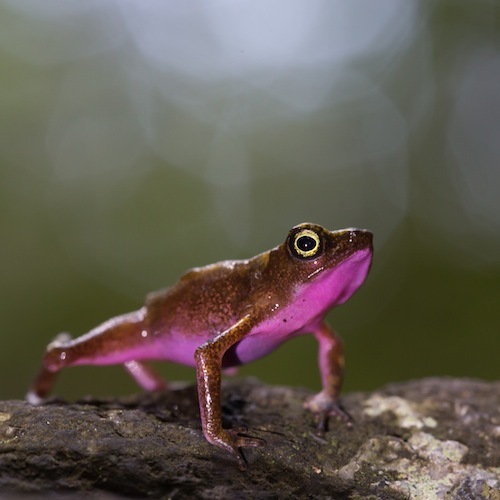 In the foreground, a tiny tree frog, Pristimantis inguinalis, pulses its brief resounding note, alternating with the trisyllabic call of Vitreorana oyampiensis, a Small glass frog. A Variegated Tinamou (Crypturellus variegatus) finally betrays its presence with its characteristic whistling. Kaw mountain, late morning, in the jumble of a secondary forest. Several White-bearded Manakins (Manacus manacus) have gathered in a courtship display area and fly about at prodigious speed, disseminating sparks of sound produced by their vibrating wings. Several doves (probably Leptotila rufaxilla) as well as a Northern Slaty Antshrike (Thamnophilus punctatus) can be heard in the background. Late afternoon, south of lake Petit Saut. A magical moment after a short but generous shower. In just a few minutes, and as the forest has finished shaking off the rain, a composite whisper builds up. Voices appear, rise, multiply themselves and at times whirl around. Perched on tall candle-like dead trees, Red-and-green Macaw (Ara chloropterus) converse and enjoy the sound of their vocal explosions propagating over the vast space. 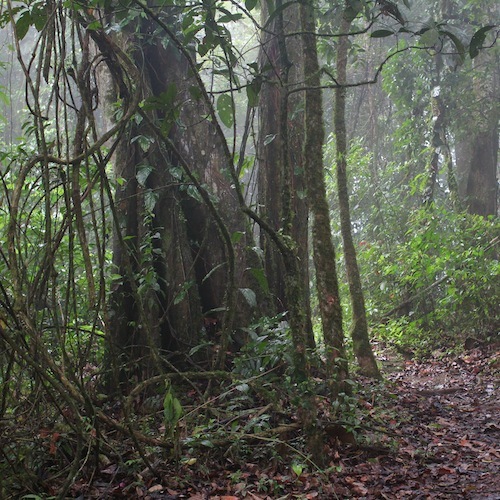 Hypnotic summary of the throbbing sound of the primary forest early in the morning with Black Spider Monkeys (Ateles paniscus), Guianan Red Howler Monkeys (Alouatta maconelli), Stingless bees (Melipona sp. ), cicadas and crickets taking the lead roles. Kaw mountain, late December. Close to a temporary forest pool. The intense downpours of the previous days have triggered the first mass amphibian breedings, accompanied by a cumulative chorus so powerful it represents a real danger for the unprotected human ear. Today, early in the night, the activity is moderately intense and enables us to appreciate the phenomenon. Two species of Leptodactylus (Leptodactylus cf. knudseni, Leptodactylus aff. mystaceus), displaying varying degrees of depth and quaver, and Dendropsophus (Dendropsophus leucophyllatus, Dendropsophus aff. minutus), with sharp high-pitched sounds, take the lead role in this hallucinogenic soundscape heralding the beginning of the rainy season. Chemin gros arbres, south of Saül. Typical soundscape, near a small creek, transmuted by the steady and hesitant arrival of a Musician Wren (Cyphorhinus arada). 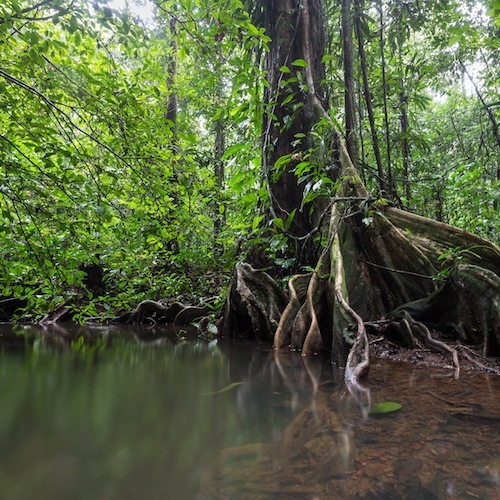 All sounds for F. Guyana were recorded in the forests and coastal regions of French Guiana in November and December 2014, 2015 and 2016. Photo credits: Anne-Cécile Monnier, Hadrien Lalagüe, Yann Chassatte, Antoine Baglan and Marc Namblard. The sounds, texts and images presented here are the property of the authors. 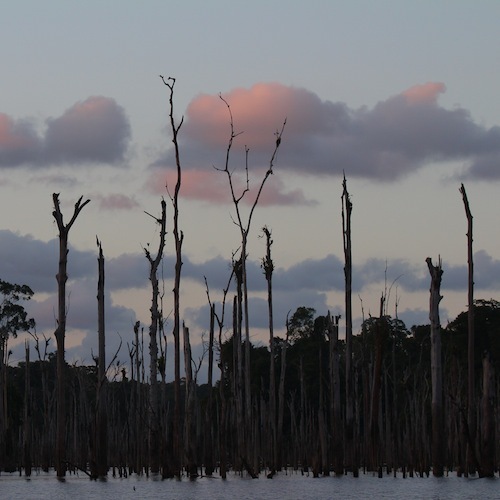 A big warm thank you to Yannick Chassatte, Fernand Deroussen, Antoine Baglan, Thomas Tilly, Anne-Laure Allègre & Nicolas Quendez, Pierre Gutierrez & Ronan Monel (Nature de Guyane), Nils de Pracontal & Charlotte Briand, Kami Khazraie, Hadrien Lalagüe, Yannick Dauby, Anne-Cécile Monnier, Daniel Wambach, Sophie Krommenacker, Orlane Cornu, Joanne Lacour, Nicolas Franek. 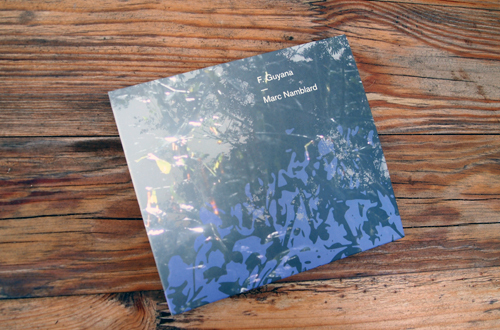 Marc Namblard is no stranger to audio-naturalistic approaches – we could remember his previous release on labels like Nashvert, Ouïe-Dire e Kalerne – and in fact even to the exploration of open-air spaces in French Guiana, which have already been the subject of long recordings. 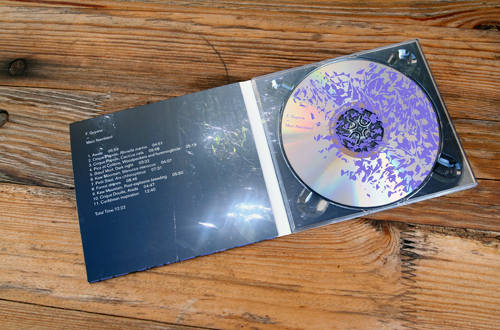 The sound collage of those first auditory captures – field recordings made between the dry season and the “little rainy season” – clearly leave a strong impression on the Parisian investigator who, for this release on the prestigious Gruenrekorder, has this time chosen, always at the same time of year, the coastal regions, surely no less charmless than other, in the forest and in the savannah, still rich in different and well detailed vibrating frequencies, of resonant fragments and enveloping iterations. 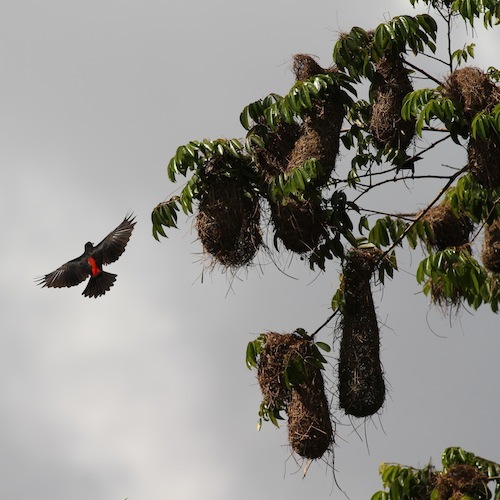 The environmental suggestions are often kept abstract, intense of a single sound, and then in other cases open to the chirping of a bird rookery, to the monkeys’ and cicadas’ gurglings – among the morning inhabitants – that are highlighted with guttural and crackling expressions. 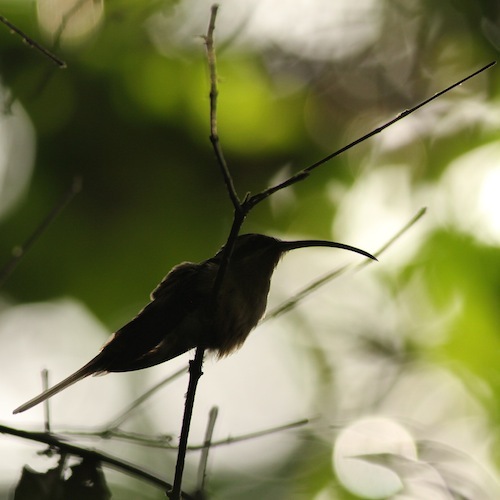 On Saint-Elie road, close to Sinnamary, an area that is still at the edge of the forest, Marc Namblard is attracted by colibri emissions, by high-pitched buzzing of ever present cicadas, and also by the constant hammering of woodpeckers. The sounds we hear are never ordinary: the collected field recordings are rich in minimized interferences and the sequences captured by drones are in other cases recordings of very specific frogs (leptodactylus, vitreorana oyampiensis and eleutherodactylus johnstonei, the ones best known), of birds (for example cyphorhinus arada or eptotila rufaxilla) or just of the ocean, accompany by the breaking waves on the beach tenuous and unsettling or by the same ones which incessantly beat on the coral reef. The whole work seems infused by the pure spirit of the original phonography and we don’t perceive any post-editing: some more “embellishment” is given by the interesting attached book, completed with suggestive color images credited to Hadrien Lalagüe, Antoine Baglan and Anne Cécile Monnier, authentic experts in these kind of shots. In conclusion, the sound space is really well defined, full of details and hyper-vivid and the listening is definitely pleasant, it is completely up to such a sedimented and valuable record series. Two recent field recording releases from Gruenrekorder, the German label that offers unparalleled high quality releases and packages in this genre. Both albums are presented in soft digipaks with booklets of full colour photographs, complementing the sounds. Both from 12th June 2017. 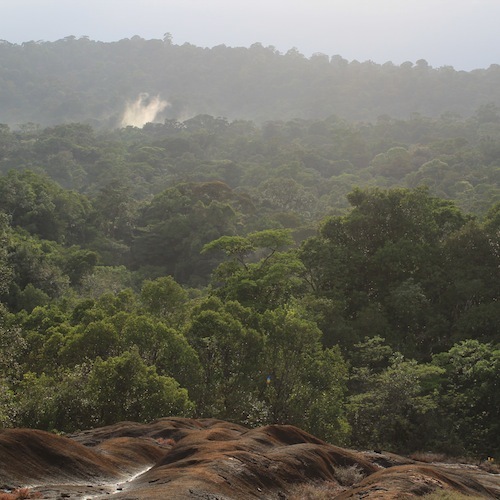 F.Guyana is a collection of soothing, detailed, often layered, and lush field recordings from forests and the costal regions of French Guiana. The CD appears on the always dependable & quality bound German label Gruenrekorder- either as a CD( which I’m reviewing), or as a digital release that features a bonus batch of tracks. 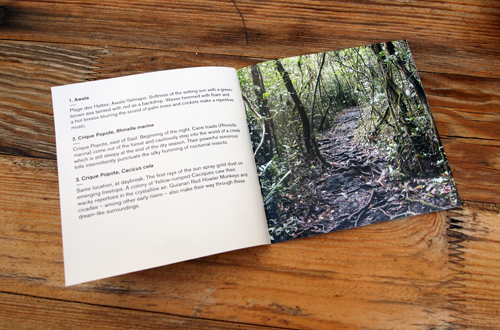 The CD comes in a four panel digipak , and this takes in hazy pictures of the Guiana jungles. We also get a wonderfully inlay booklet, which takes in moody-to- brightly coloured photos of the wildlife & natural landscapes of French Guiana. 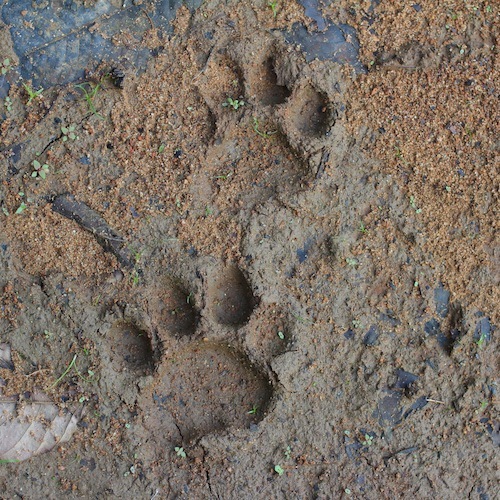 As well as a small write up for each track, described at what time of day they where recorded, and what wildlife & natural sounds are involved in each tracks make up. All the recordings on the release where made & edited by French field recordist & artists Marc Namblard. And I must say he has both a fine ear for interesting sounds, as well as an ability to know when & where to finish a track. Both of course are vital to making a good field recording album, that’s fascinating & re-playable- and that’s exactly what F.Guyana is. The CD takes in eleven tracks, & these have running times between three & fourteen minutes- with an album total runtime of seventy two minutes. Over hour worth of field recordings may seem a little much, but Namblard keeps you captivated through-out, with the wonderful selection of unique & soothing sounds. As we’ve come to expect from a Gruenrekorde release- the recording quality through the release is crystal clear, detailed & perfect balanced. The album opens in fine lush & soothing fashion with the track “Awala”- this just under six minute piece takes in a recording of the coast at dusk- bringing together the rich layers of crash & foaming sea, with a back drop of crickets & the sound of a gentle breeze blowing the palm trees. Track three “Crique Popote, Cacicus Cela”- is taken at daybreak, and offers up just over nine minutes of detailed & complex map of sound- taking in the manic twittering sound of yellow-rumpled Cacique Caw, Guiana red Howler Monkeys call, and the constant hissing of Cicadas. Track nine “Kaw Mountain, Post-Explosive breeding” is nearing six minute of Alien like chippings, cascading layers of chirping, with a underlying & distant selection of more random twitters & chip. This track truly sounds so alien & surreal in it’s make-up, really taking your breath away with both it’s complex layers & detail. I’ve now been playing F.Guyana on & off for last month or so, and each time I come to it again it’s sounds as fresh, vibrate, and rewarding as before. It’s one of the field recording highlights of 2017- that will be of interest to both field recording fans, as well as those who are fan of more textured sound composition too. 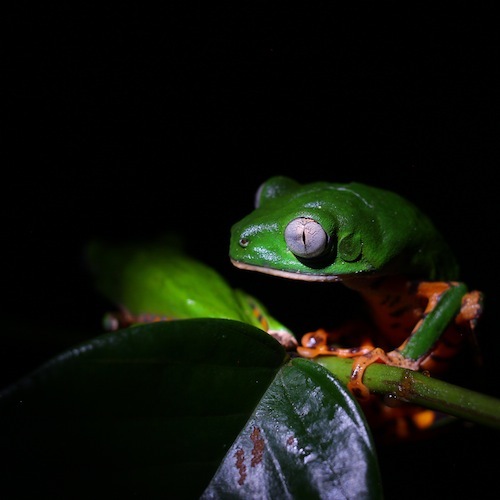 To create F. Guyana, Paris-born Namblard, since 2000 a nature guide, wildlife sound recordist, and sound artist in Lorraine, collected field recordings from the forests and the coastal regions of French Guiana between 2014 and 2016. As mentioned, the seventy-two-minute recording is largely free of artistic intervention apart from the imposition of track durations and the sequencing of its eleven tracks. It’s no less effective, however, for being more straightforward in its presentation than Klement’s, especially when the details of the various French Guiana locations are so vividly captured. Some sounds, such as water burble and insect thrum, are generic as far as field recordings-based material is concerned, but many others give the project a distinctive character. 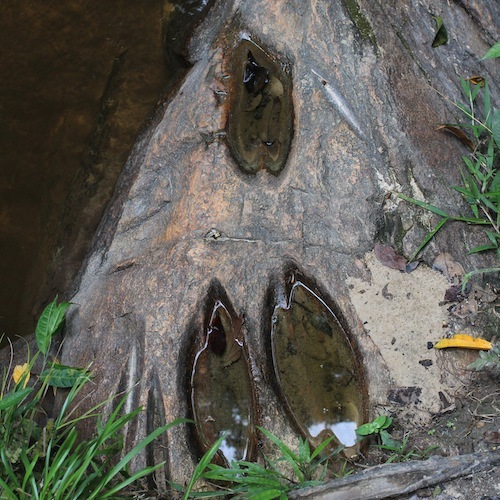 “Crique Popote, Rhinella marina,” for example, is distinguished by the rather woodpecker-like trilling of Cane toads, whereas “Crique Popote, Cacicus cela” similarly tickles the ear, in this case with the bright cawing of Yellow-rumped Caciques and the unsettling cries of Guianan Red Howler Monkeys. 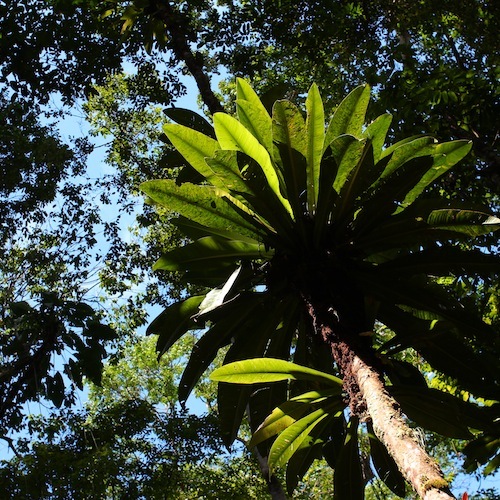 Generated by Black Spider Monkeys, Red Howler Monkeys, bees, cicadas, and crickets, the cumulative throb roaring through “Forest drones” is also undeniably arresting (at one point, the strangulated wail startlingly begins to resemble the hollow death rattle of a dying person). F. Guyana is also, strikingly, a great deal more ‘musical‘ than one might expect, given its concentration on undoctored nature phenomena. Animal and insect sounds punctuate droning backdrops of bird chatter and cicada thrum in a manner that suggests the organization of a formal composition. During “Petit Saut, Ara chlroropterus,” to cite one instance, it’s easy to regard the raw vocal declamations of the Red-and-green Macaw as a lead ‘instrument‘ of sorts, with the other sounds taking their place as ground to its figure. 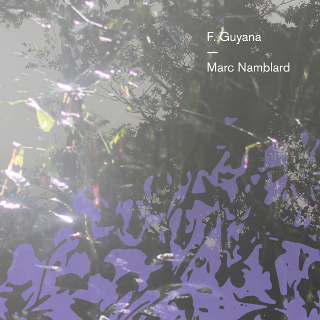 Like any effective field recordings-based project, Namblard’s enables the listener to arrive without traveling, so to speak: even if one never ventures to the coastal regions of French Guiana, F. Guyana certainly allows one to get some vicarious sense of what it would be like to do so, through both auditory and, because of the booklet photographs, visual means. With the weather being all sunny, and located in a very quiet neighbourhood, I sleep with windows open and every morning birds awake me quite early. Being no ornithologist, I have no idea which one, but one of these birds makes a very high-pitched noise, which is, come early morning, quite irritating. How remarkable, I thought a few hours later, that I don’t mind hearing such sounds when they arrive on compact disc. Gruenrekorder is a German label with an extensive catalogue of works that deal with field recordings (you know this of course from the many reviews already appeared here) and here we have two new ones, dealing with places I have never been too. Which always made me wonder if that is a ‚problem‘ or not; can I fully relate to the work at hand, without ever visited the place? Of course it is a bit of a theoretical question, since the review has to be written anyway. I started this little trip overseas (for me that is) and joined Marc Namblard on a journey through France Guyana. Namblard, who calls himself a ’sound artist and naturalist‘ is from the North of France and has a few releases to his name (see Vital Weekly 624, 737 and 914). 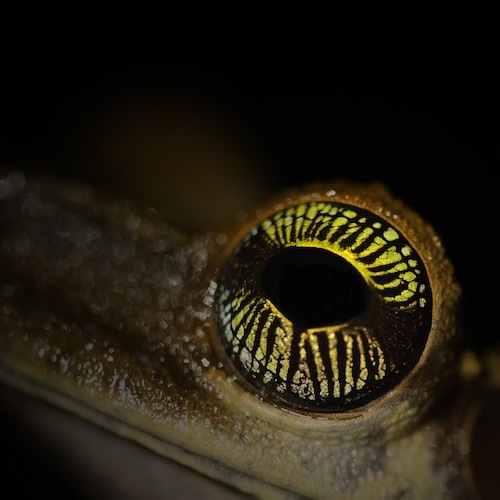 Namblard is entirely focussed on recording the sounds of the rain forest and animal life within that. In the booklet that comes with this (and as usual, no expenses are spared with Gruenrekorder) Namblard gives us information about the location where did his recordings and what kinds of animals we are hearing. He certainly seems to know his stuff. What particularly struck me in the eleven pieces here was the fact that many of the sounds we hear are very minimal and repetitive and also quite musical. I am not sure how that Namblard does his editing, be it that each of these pieces is a strict recording of a particular event with nothing else than just cut ’n paste, or if there is layering of sounds, looping or such like. 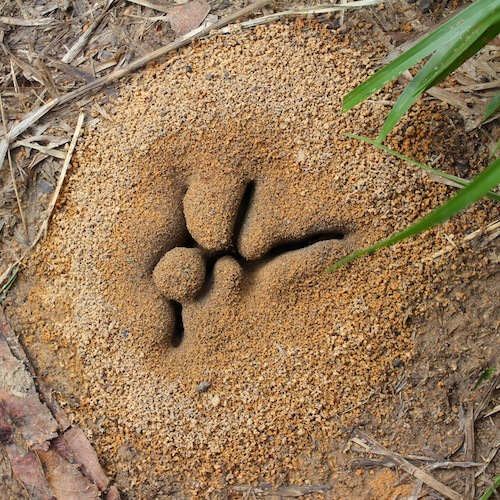 In a piece like ‚Crique Popote, Rhinella Marina‘, we hear the beginning of night with far away chirping of cicadas and close by the Cane toads (also known as Rhinella marina) and the way the piece unfolds sounds very much like a song; one sound coming in on it’s own and later on repeated, altered a bit, and becoming a kind of chorus. As the CD progresses the sounds get more and more minimal, but also they seem to be electronic; here I was thinking about that bird that woke me up this morning. In ‚Forest Drones‘ one could easily mistake the repeating sound to be that of lo-fi cassette loop, and in ‚Kaw Mountain, Post-explosive breeding‘ it sounds like a synthesizer. It is not easy to think of all of this in terms of ‚just‘ natural sounds, but so it is. This is an excellent release of pure field recordings sounding like some great music. […] Both of these new Gruenrekorder releases are excellent, but I preferred the one by Namblard to the one by Klement, mainly for it’s minimal approach that worked out quite musically. Absolutely soothing in its reinterpretation of the real, Marc Namblard casts a gorgeous spell on “F. Guyana”. Nicely documenting a world that few others get to truly engross themselves in, the way the piece unfolds is quite masterful adhering to Luc Ferrari’s love for his surroundings. Elements filter in and out of the mix, as every song represents yet another step in the journey. Naturalistic in tone, there is something so warm and inviting about the way Marc Namblard lets the sounds speak for themselves with minimal interference. Sleepy in sentiment is the opener “Awala” with gentle waves giving the sound a distinctly summery flair. One of the most fascinating track is “Crique Popote, Cacicus cela” where the unique sound of the bird at times recalls the digital synthesis of Florian Hecker’s work in terms of its almost angular digital sound. A meditative spacious drone is dominant on the blissful atmosphere of “Boeuf Mort, Dark night”. Much more ominous in execution is the eerie sheen of “Forest Drones” whose tension is without relief. Surreal and yet another highlight comes from the primal disorientating sound of “Kaw Mountain, post-explosive breeding”. 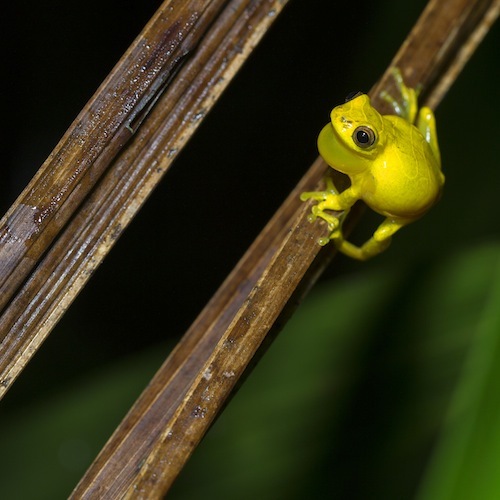 As a nice touch Marc Namblard include a digital bonus, which includes the playful “P.St-Elie_Hypsiboas boans”. With “C.Caiman_Midnight calls” Marc Namblard highlights how space is explored by birds with their echoing calls. Ending things with a thoughtful attitude is the luxurious “Salvation’s islands”. Quite engrossing in the unusual locale and the unusual sounds of the lovely creatures who reside there, Marc Namblard delivers a gorgeous view of the world on “F. Guyana”.